DERRY City have dismissed what they described as a “derisory offer” for one of the Brandywell club’s Under-19 star players. Hot on the heels of Friday night’s disappointing defeat by St. Patrick’s Athletic, Bristol City, who gained automatic promotion to the Skybet Championship having won League One last season, made a bid for Patrick McClean, younger brother of James. The approach follows a one week visit to Ashton Gate recently by the teenage centre-back, who had been accompanied by team-mate, Georgie Kelly on that trip. However, while Derry City refused to identify the size of the bid tabled by Bristol, insisting that it was well below what would have been expected from a cross-Channel club, it’s understood the Creggan Heights lad is content to remain at home in the meantime. “Bristol City have made an offer for Patrick McClean and that offer is considered a derisory offer, one which we dismissed immediately,” said a Derry City spokesman. “Obviously we’ve informed Patrick but, to be fair, he appears to be keen to remain at Derry City to further his development,” added the spokeman. There’s no doubt either that the tentative move for the 18-years-old, could well be followed up by an improved bid prior to the opening of the July Transfer Window. Meanwhile, another graduate from Derry’s underage panels, Josh Daniels’ performance against St Patrick’s Athletic was one of the few positives taken from the match by team boss, Peter Hutton. The winger, who has fought his way back into Hutton’s plans, was handed his first league start since the 2-0 home loss to Galway on May 8th last. It was his eighth appearance of the season and just his fifth league start. For a player who was expected to deliver on a regular basis for the first team squad this year, it’s been disappointing so far but he’s determined to work hard and stake his claim on a wide position. He was certainly a bright spark in the Derry attack during the opening 20 minutes of Friday’s match. And after Patrick McEleney’s legitimate claim for a penalty after 25 seconds when he was tumbled in the box by Jason McGuinness, Daniels created a glorious chance to break the deadlock. On 13 minutes he did superbly to weave his way into the St Pat’s penalty area before driving a left footed shot towards the near post but Brendan Clarke was alert to parry away the danger. He was in a promising position once again seven minutes later after McEleney played a beautifully disguised reverse pass into Philip Lowry. With Daniels free in support on the left wing, Lowry opted instead to play Cillian Morrison through on goal and he blasted his shot over the crossbar. So it could have been a different story for Daniels and Derry City but once Aaron Greene’s 20 yard strike on 26 minutes found the far corner of Gerard Doherty’s net, there was only ever going to be one outcome. And once the slick Inchicore outfit added a second 10 minutes after the break through James Chambers’ free-kick, there really was no way back for the ‘Candy Stripes’. Chris Forrester then put the finishing touch to an excellent performance from the visitors in the dying embers of the game with a wonderful individual goal. It was Derry’s fifth home loss this season, their heaviest defeat at Brandywell so far but Daniels opted to remain positive and he was delighted to be back involved with the first team. “I’ve trained well this last few weeks and I think it’s helped me with the suspensions, but I’ve been working hard and I’m glad to get my chance,” he said. And he was full of praise for the way in which St Pat’s went about their business. “You see the way they move the ball it’s like clockwork. I don’t think that team has been changed in about four years. They’ve stayed together and you can see it’s a group whereas we are still trying to achieve that. For Peter Hutton the game hinged on a referee’s decision following the kick-off. Patrick McEleney hounded St Pat’s centre-half, McGuinness ,who was attempting to play the ball back to his keeper. And when McEleney went to ground after a tangle with the ‘Saints’ defender, there were furious appeals for a penalty from the Derry bench but referee, Derek Tomney waved ‘play on’. Hutton felt that incident warranted a penalty and a sending off - with McGuinness being the last man - but he believes Dublin official, Mr Tomney turned a blind eye to the offence simply because it was so early in the match. “I thought we should have certainly had a penalty,” claimed Hutton. “Patrick McEleney spoke to Jason McGuinness afterwards and he told him that he caught him on his calf. “So it should have been a penalty and a sending off and that would have changed the game entirely. 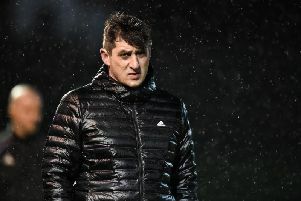 Overall the Derry manager was furious with the standard of officiating during the game as he felt a string of decisions went against his side. “I thought it was poor officiating on the night overall,” continued Hutton. Derry City -G. Doherty: S. Kelly (C. Harkin 84), S. McEleney, A. Barry, D. Jarvis; J. Daniels, P. Lowry, B. McNamee, P. McEleney (G. Kelly 77), R. Curran; C. Morrison (R. Curtis 69); Subs Not Used - S. Patton, A. Elding, N. Boyle, S. Sharkey. St Pat’s - B. Clarke; G. O’Brien (S. Hoare 61), J. McGuinness, L. Desmond, I. Bermingham; A. Greene, K. Brennan, G. Bolger, J. Chambers,C. Forrester C. Fagan (J. McGrath 77); Subs Not Used - C. O’Malley, M. Langley, C. Kilduff, S. Verdon, C. McCormack. Referee - Mr. Derek Tomney (Dublin).